N2 Stampin': Check These Out! I have had a very busy schedule lately! Sorry about not posting anything for you! I had a Mystery Hostess party which was a total blast on Saturday a week ago and I also had a bracelet making class the same night! We made three cards which I can't wait to share with you and I will very soon and I'll try to share the bracelets as well. I also had some wonderful classes this past weekend where we made some really nice things and I can't wait to share with you either. I've been doing a little traveling with my family, we went to Destin this past weekend and we are going to Jacksonville and St. Augustine tomorrow. I hope we get to enjoy the beach some because it rained most of the time when we were in Destin. Maybe I'll share some of our trip photos too. It is nice not to have the kids tied down with school for a little bit. I did want to share my pictures of the "Decor Elements" that I have put up in my home so far. This one is placed over some of my family photos. It seems to make the pictures stand out more and definitely more special, don't you think? I just love the way that this looks on the wall. It is the chocolate brown color. The one below is the one I chose to put on the stone tile on my fireplace. It was very simple to put on. It really think it adds a nice touch. What do you think? It is also the chocolate brown color. This one below is another medallion that I put in my bathroom above my towel bar. I hope that my camera was crooked when I took the picture because I would hate to think that my towel bar is that crooked! LOL! This one is also the chocolate brown color. I just love the way these look on the wall...I could really go crazy with them! They are so very easy to apply. 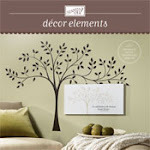 Send me a comment and let me know what you think about these "Decor Elements"! Let me know if you would like to order some for yourself! I'm so excited about these! I'll be posting some cards for you to see soon but it might be Saturday before I can get to it. I like it. The one on the fireplace turned out very nice! You may change my mind after all.